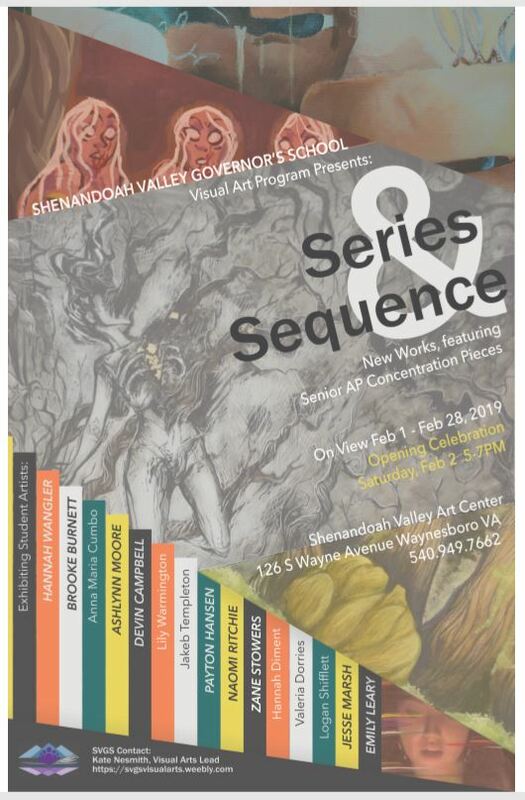 The Visual Art Department of SVGS invites you to our Winter Art Show, generously hosted by the Shenandoah Valley Art Center in Waynesboro, Virginia. The show will be on view February 1-28, 2018, with an opening reception celebrating our students’ achievement on Saturday, February 2, 2018 from 5-7PM! Additionally, visitors can view the show from 10am – 4PM, Tuesday – Saturday. Each student in the program has a piece included in the exhibition, representative of their efforts and growth this year. Our seniors have also included work based on their individual portfolio concentration topics. We will also be hosting a silent auction of the coral reef ceramic sculptures built by our junior class. The proceeds from the sale of these pieces will be donated to the Coral Reef Alliance, to help fund research on mitigating coral bleaching in the world’s oceans. We hope to see you at our opening reception, Saturday, February 2 from 5-7 PM.